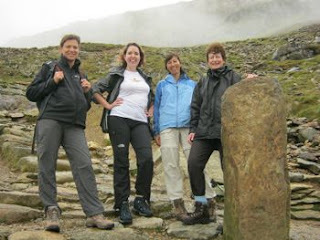 I'm part of a team of 10 people going on an amazing trek to Everest Base Camp (5,364 metres) in October 2011. We have pledged to raise £10,000 each, so £100,000 in total, for the charity Women for Women International UK. That's in addition to the cost of the trek which we are paying ourselves. Glyn and I and my friend Lizzie Rosewood had a great night when we helped out at the Pateley Bridge Charity Dance, which this month was in aid of Women for Women International UK. A few days later the organising committee sent me a cheque for £450 to go towards my fundraising target - absolutely brilliant! It was an amazing evening! The hall was beautifully decorated, the music (thanks to Elizabeth Harrison) was delightful and the dancing was lovely to watch and take part in. We really enjoyed having a go at some of the Old Time and Sequence dances. I don't think we'll be called up to put the pros though their paces on 'Strictly' any time soon, but we didn't embarrass ourselves too much! My legs and feet are still recovering from this one! The Dark Horse Ceilidh Band really put us through our paces. Right from the start everyone threw themselves into the spirit of the evening - there was no hesitating or waiting for others to get up first. And we raised the fabulous sum of £744! Ray Black, the leader of the band, had organised for a group of Molly Dancers to entertain us at the mid-evening break and they were great fun to watch. Molly Dancing steps look a bit like Morris Dancing but the costumes are very different. The dancing is associated with the annual Plough Monday tradition (the first Monday after Twelth Night), during which young farmhands would drag a plough round the local villages, crying "a penny for the plough boys", and if no penny was forthcoming cut a furrow across the cheapskate's front lawn. To everyone who came and danced and everyone who provided music, raffle prizes, food, the venue and help with selling tickets - THANK YOU SO MUCH FOR YOUR SUPPORT! 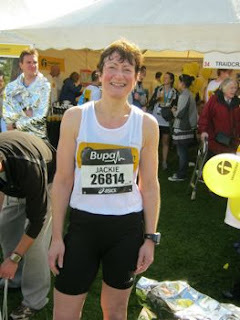 Still feeling elated following my PB of 2.00.40 at the Great North Run yesterday! It was a great improvement on last year's PB of 2.07.35. 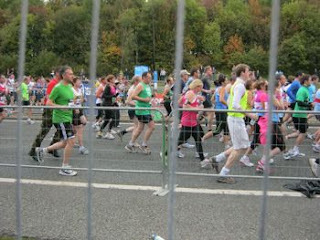 Those elite athletes had better watch out - I was an hour behind them last year and now I'm only 53 minutes behind!! I put most of my improvement down to CrossFit. I think it has really strengthened me both physically and mentally. It's made a big difference to my running and has been fantastic preparation for my Everest Base Camp challenge. I'm so grateful to Pete and Andy at CrossFit HG3 - http://crossfithg3.com - for their patient coaching and encouragement. Had a lovely bath last night and a good night's sleep and overall I don't feel too bad this morning. My joints feel a bit creaky but my muscles aren't too achey even though I've yet to do some proper stretching. I've got a streaming cold though. I've been fighting this cold for probably over a week with various homeopathic and ayurvedic remedies and they worked sufficiently to get me through the Great North Run. In the first half of the race it was sunny and warm, but we all got absolutely soaked in the second half and after I finished I got quite cold and this is the result. 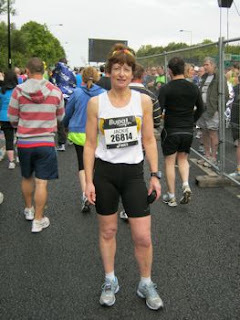 For the first few miles of the race I felt strong and my pace was too fast really. I was aiming to keep steady at about 9.10 minutes per mile but I was doing quite a bit under 9.00. In the middle part of the race I was still ahead of schedule but by 10 miles I was just about at the time I'd planned for a sub 2 hour run. The course is generallly quite hilly and although the steepest hills are nearer the beginning there's a steady climb from mile 10 to just before you reach mile 12 and this was when I started to slow up. Then right at the end there was quite a jam and it was hard to get round people, although I don't think this cost me more than about 10 seconds really. At the end I was quite wobbly and emotional and cold and it seemed to take forever to get to the Traidcraft tent in the Charity Village where I was meeting my husband Glyn. 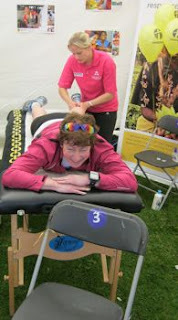 I ran for Traidcraft this year which is a charity I've supported for a while now. It was lovely to see Glyn waiting for me there. He said he'd managed to catch a glimpse of the back of me at the end and had cheered me on but I'd looked really focussed and hadn't noticed. Charlotte and the team at the Traidcraft tent were just brilliant, providing lots of praise and TLC in the form of warm tea, loads of yummy snacks and a wonderful massage! We finished the day in the best possible way, with fish and chips at Coleman's in South Shields town centre. Absolutely delicious! 40 seconds over target but still EUPHORIC! Well, I got pretty close to my target of under 2 hours for the Great North Run today, but that last 0.1 of a mile over 13 miles did for me! I managed 2.00.40. I did my absolute best though so am feeling elated! Got lots to tell and photos to show and will post more tomorrow. Am now much in need of a hot bath and an early night. I've had some great publicity in the Harrogate Advertiser today. The dance in Pateley Bridge this evening is listed in the What's On section of the Week-End guide; I've got a good mention in an article about the Great North Run on Sunday, together with a photo showing me in training at Crossfit HG3 with Pete and Andy; and there's a nice article about my Ceilidh on 25th September, telling people how to buy tickets. So I'm well-pleased! Another thing is that when I spoke on the phone to the reporter who wrote the article about the Great North Run I opened my big mouth and said that I really wanted to do it in less than 2 hours. And she's quoted me as saying this! Well, I'm definitely not climbing to the top of Everest so I've simply got to do under 2 hours in the Great North Run! I managed a sub-hour 6.5 mile run last Sunday so all I have to do is run another 6.5 miles at the same pace. Should be a doddle! And finally, some really good news. The team fundraising total so far is nearly £42K! Two team members have actually reached their target and are still going strong. I wish I could say the same but overall I'm very pleased with how my fundraising has gone and the amazing support I've had from so many people. I'm delighted to say that I'm just a few quid short of £5K now - so nearly half-way to my £10K target. With the Pateley dance tonight and the Ceilidh next week-end I hope to be up to somewhere between £6K and £7K before I set off on the trek on 4th October. Then when I return on 20th October it'll be all-systems go with fundraising again until I reach £10K. Last week-end I was lucky enough to join 3 other members of the Everest trek team on a training week-end climbing Mount Snowdon. One of the best bits was that to get even more psyched up for our amazing experience we stayed at the Pen-Y-Gwryd Hotel, a traditional mountaineer's hotel at the foot of Mount Snowdon, where Sir Edmund Hillary and Sherpa Tenzing Norgay trained for the first successful ascent of Mount Everest in 1953. 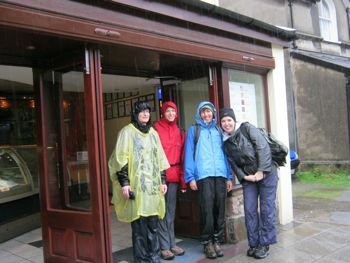 The plan was to climb Snowdon on the Saturday but this had to be abandoned as the rain just bucketed down all day and it was quite windy too. We went for a walk in the lovely village of Beddgelert instead and stopped off for an obligatory ice cream at an award-winning ice cream parlour, as you can see. Ok, so it wasn't ice cream weather but it would have been rude not to! The next day when we were all supposed to be travelling home was glorious weather of course! So we got up early and did as much of the climb as we could manage in the time we had. We think we managed about two-thirds. The week-end was great fun and it was really good to get to know some of the other women with whom I'll be sharing this incredible Everest adventure. 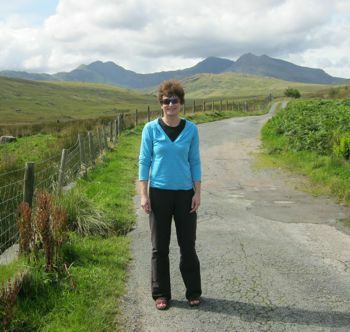 It was a good test of the trek clothing I've recently bought which withstood the elements pretty well and were comfy. Also, my knees were much better than when I did the climb last year so all that work in the Crossfit gym, the yoga, the pilates, etc. has been worthwhile. 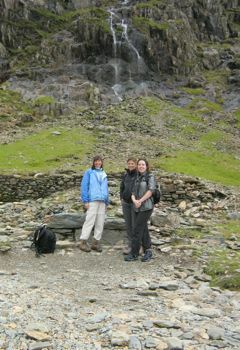 Here are some more photos of us amidst the awe-inspiring glory of Snowdon. I am 52 years old and live in the lovely town of Harrogate with my husband Glyn and our cat Gingie.